Cockatiel Fun and Recap of what has been going on! Oh wow! Where has the time gone? I am so sorry for the lack of updates. I was the Animation Supervisor in the last project I worked on and it just took so much of my time leading up to Christmas! I was working 6 days a week and pulling quite a few late nights too. Then I went away to Japan for a couple of weeks and then spent a few days, before going back to work, sleeping. I got back to work last week and have just started getting into the swing of things again. This time, I am a Team Lead for one of the animation teams for a TV series. It's a lot of fun and games changing roles and projects! 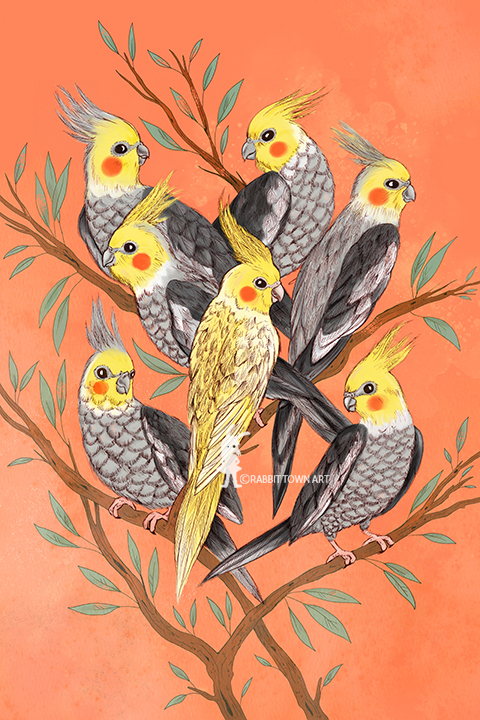 The Cockatiel design is currently one of my most popular on my Redbubble shop. Do check it out! It's the design that's been bought in a whole range of products and dresses. I am now in the middle of the TV series ramping up, I am also currently working on a new design to go into my shop! I hope people like it when am done! Feel free to comment and ask me questions and stuff!